TV show dates: November 5, 2015 — September 8, 2017. Performers include: Tig Notaro, Noah Harpster, John Rothman, Stephanie Allynne, Rya Kihlstedt, Carly Jibson, Beth Grant, Carol Mansell, Casey Wilson, Sheryl Lee Ralph, and Adora Dei. 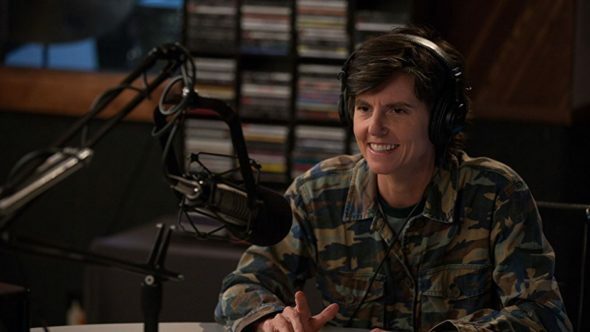 A semi-autobiographical “traumedy” based on the life of comedian Tig Notaro, who created the series with Diablo Cody, the One Mississippi TV show ponders what happens when you must go home again — whether or not your truly can. The story centers on Tig Bavaro (Notaro), a Los Angeles radio host. Upon the sudden death of her mother, Caroline (Kihlstedt), Tig returns to home Bay Saint Lucille, Mississippi. There, she must come to terms with her monumental loss, while dealing with health challenges of her own. Back in Mississippi, Tig feels like a fish out of water. Her brother Remy (Harpster) and stepfather Bill (Rothman) may be there to fill the gaps, but they’re not exactly adept at doing so. The series explores the laughter and tears of family ties that bind, as Tig grapples with her mom’s death and comes to terms with her past. What do you think? Do you like the One Mississippi TV series? Should this TV show have been cancelled or renewed for season three on Amazon? This was a completely well done two seasons. Amazon made a mistake in dropping it. Wish I had found it earlier and could have helped generate a bigger groundswell to urge them to change their minds. Really enjoyed the show. Very sorry to see it cancelled. This show has been a lifechanger to me and look forward to watching each episode, wish it was a full hour. Amazingly funny realistic show!! Love it!!! Love this show! It’s so real! Please give us more!